Voting ended in a tie. Gabi must Record music videos lip syncing to 5 trashy songs or Watch 5 of the worst movies of all time and write positive reviews about them or Wear a silly wig at uni for a week. Gabi is raising money to support the Southern Corroboree Frog. Voting is now closed. Gabi's pledge is closed for voting, but you can still support Gabi and the Southern Corroboree Frog by making a donation using the 'Make a Donation' button above. 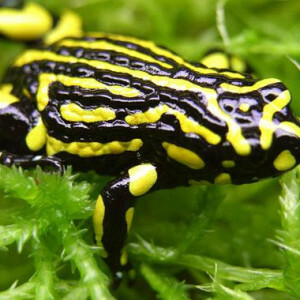 Help Gabi raise money for the Southern Corroboree Frog. Support Gabi Levay by donating directly to the Southern Corroboree Frog.